We have always placed the highest importance on maintaining the most natural rug pads in the industry. While we know this and try to educate our customers about the same, it’s always a nice welcome to have someone else’s point of view, especially when it is a positive one. For this reason, we’re extremely grateful that Ashley of Ashely’s Green Life requested some of our products for her use and review and we’re even more grateful for her positive feedback. Ashley owns and maintains her blog to be found at www.ashleysgreenlife.com – a great resource of all things natural and Green. In her blog, Ashley talks about her daily life under Green living – From cooking and housekeeping to decorating and more, Ashley describes and explains to her audience what and how she does to maintain the Green home that she and her family live in. So, in order to maintain her Green standard of living, Ashley found the need for some rug pads under some area rugs she recently placed in a few areas of her home. You can see from the video that Ashley chose our two flagship rug pads, Ultra Premium and Superior – Both dense felt rug pads with one containing an added layer of natural rubber for those rugs that tend to slip. Ashely proceeds to explain her choices and how she made them, as well as showing the placement of each of our rug pads on her floor. it is obvious from her web site and the video that she places great emphasis on maintaining her Green Home and we are extremely honored to have been chosen as the rug pad supplier of choice! When you take the time to view her video of your experience and feedback of our company and products, we think you’ll be impressed. Rug Pad Corner offers only four rug pads that cover all types of uses possible. While there are so many more rug pads available in the industry, we refuse to carry most based on the chemical and adhesive content within those products. We are proud to be affiliated with a few established Green Organizations, as we constantly strive towards offering the most natural rug pads found anywhere – Achieving this is easier for us than others since we actually control the mills where our rug pads are made, right here in the USA. Feel free to shop securely at www.rugpadcorner.com and get ready to offer your rugs, floors, home and family the most natural rug pads made today! Calling all interior designers, the Rug Pad Corner Trade Program is your opportunity to purchase the finest quality rug pads for your clients through our trade-only portal. Our program caters to your interior design needs where you can order all sizes and shapes of our rug pads at trade pricing. Over the years of your business, we have been fortunate enough to attract the interior design trade. With a customer base of hundreds of designers, Rug Pad Corner is honored to be the chosen source of quality rug pads for clients around the United States. Based on this, we recently created The Rug Pad Corner Trade Program – A very user-friendly environment in which registered designers may place their rug pad orders at trade prices. Obtaining access is as simple as completing a short registration form and upon approval, the sign in credentials are forwarded along to allow access to the trade-only web site. “Our Rug Pad Corner Trade Program is an excellent way for designers to offer their clients the finest rug pads made today”, states Sam of Rug Pad Corner. “And since we know these same designers can shop elsewhere, we are extremely appreciative to have been chosen as their supplier, so we offer special pricing to the trade only”. Sam goes on to explain that designers can either offer the discounted prices to their clients, or they can resell the rug pads at a nominal profit. “Another advantage of being a Trade Member is that we will fulfill designer orders catered to special requests, if any”, states Sam. This means that trade members can stipulate a variety of criteria to fulfill an order, such as custom sizes and shapes and the ability to show the designer as the shipper on the shipping label. “There are some designers who want us to remain anonymous for their own reasons, so we will do what it takes to fulfill this and other requests”, states Sam. The Rug Pad Corner Trade Program offers every one of the rug pads normally available by the company to consumers. Trade members can choose from felt and rubber rug pads to all rubber to rug to rug pads – Every type of rug pad is all natural and safe for use on all types of floors. Trade members sign into a special version of the Rug Pad Corner web site where they can make their selections at reduced trade-only pricing. Members can include any special requests assigned to each order and we will follow them all. In regards to processing and shipping times, trade orders always ship within 24 hours and we always accommodate timed shipping requests. Virtually any request trade members have can be fulfilled to make the buying process as simple as possible. To inquire and possibly register for The Rug Pad Corner Trade Program, please send inquiries to trade@rugpadcorner.com. We will gladly reply to inquiries within 24 hours. As of July 1. 2015, we are including a set of our best selling DURA-GRIP furniture grippers with every rug pad order at no charge – It’s our way of saying “Thank You” for our customers’ patronage. DURA-GRIP® is our exclusive gripper pad that truly stops all furniture from sliding and now every Rug Pad Corner customer can enjoy the benefits of this product as we include a set of 3″ square pads with your rug pad order, no minimum. With years of experience in the area rug, flooring and rug padding industries, we have had thousands of requests for a product that stops furniture from sliding on a hard floor surface. One of the most common pieces of furniture causing issues is a sectional sofa – Due to size and weight, a sectional sofa easily slides across a floor and this can cause damage to the floor and any close walls. After much trial and error and two years of testing, we finally perfected DURA-GRIP® – Our exclusive furniture gripper pad that is placed under any furniture leg to effectively prevent moving and sliding. Since its inception, we have shipped more than 500,000 sets of DURA-GRIP® to customers in The United States, Canada and Australia. As a “Thank You” to our rug pad customers, we have decided to include a free set of DURA-GRIP® with every order starting July 1. 2015. The set includes four pieces of our 3″ square gripper pads, a very popular size and shape that seems to fit under many types of furniture. “We discovered that many customers place an order without knowledge of the fact that we offer DURA-GRIP®”, states Sam our founder. “So, we decided to include a free set to every customer so that they can realize the benefits of our product”. Sam explains that when some customers realize the affects of DURA-GRIP®, they desire to buy more and offer protection to their floors. DURA-GRIP® is so effective that it serves a few purposes. It is most known for its ability to stop all furniture from sliding on all floors – This is a big accomplishment, as many homeowners constantly deal with the issue of their furniture sliding and moving on their floor. The other purpose for using DURA-GRIP® is that fact that it serves as an excellent floor protector – As it prevents furniture movement, it is also protecting the floor against possible damage, such as scratches and dents from furniture. Overall, DURA-GRIP® offers excellent protection against a few potential problems and is a pad safe for hardwood and all types of floors. When a customer places their order on Rug Pad Corner, they will notice a message that states the order comes with a free set of DURA-GRIP® – There is nothing that the customer needs to do, as the DURA-GRIP® pads will be automatically included in the order. Once we cut each rug pad order, we will include a set of 3″ square DURA-GRIP® within the same package. When the order is delivered and the customer unwraps the package, the DURA-GRIP® will be visible and ready to unwrap and use. Customers can simply place one gripper pad under each furniture leg. Since the free set includes four pads, this is popular for chairs or any furniture with four legs. If more is needed, customers can visit the web site or call to place an order. DURA-GRIP® pads range from $8.99 to $49.99, depending on size and number of pieces in package. Visit www.rugpadcorner.com for your next rug pad needs and receive a free set of DURA-GRIP® as our way of saying ‘Thank You” for your patronage! In a previous post, we discussed the fact that we use a Heat Pressing Process to reinforce our felt rug pads, where others use adhesive. Since then, we have discovered that some sellers are advertising their products as being “Heat Pressed”, when unfortunately this is not the case. The method of Heat Pressing rug pads is a costly and rare process that took years for us to refine – It is so specific and limited that we even registered a mark for RPC Heat Pressed® with the United States Patent and Trademark Office in order to protect the name and process. We felt the need for this protection due to the fact that the Internet makes it quite easy for others to duplicate our content and without the proper protection, we were concerned that we may see our terms on other web sites. Apparently, part of this is true, as we discovered a few sellers using the term “Heat Pressed” in reference to their felt rug pads. The rubber in our Ultra Premium® Rug Pad is Heat Pressed to the felt, avoiding the use of any adhesive or chemical found in other pads. Heat Pressing is a process used to avoid the content of adhesive and chemicals within rug pads. Imagine a felt rug pad that is compressed into a certain thickness. The fibers within the pad can sometimes shed and fall apart, creating the need for reinforcement. All other manufacturers and sellers use an adhesive coating on each surface of their padding – The adhesive acts as a bonding agent that when dry, holds the fibers of the rug pad together to prevent shedding. While this hold is essential in the use of the rug pad, unfortunately adhesives are known to weaken the fibers, as well as cause damage to floors, off-gas and smell. Rug Pad Corner always knew we wanted to avoid any adhesive, so we developed an intense Heat Pressing process exclusive to us, hence the trademark RPC Heat Pressed®. Our followers, customers and readers have always seen us offer as much knowledge and information about our products and about the area rug and rug pad industries in general. In keeping with this business model of information, we felt the need to make our readers aware of the fact that some (very few) sellers are referring to their products as being “Heat Pressed”, when in actuality they are coated with the same adhesive as all other suppliers offer. “One drawback of the Internet is that it easily allows competitors within an industry to “copy” information from one web site to their own”, states Sam Kaoud, our founder. “This deceitful method of advertising is not only unethical, it also is simply wrongful behavior towards potential customers of your products.” Sam explains that every seller of any product should only describe it to be what it is, nothing less and nothing more. Unfortunately, there are some sellers who offer information based on what they know customers want to see and believe, hence the false product descriptions. An important thing to know when considering rug pads is that most pads are made with some adhesive within the manufacture of the products and the sellers have no control over this. It is just as important to know that since most online merchants control the information available in their web site, that they easily manipulate product descriptions to their advantage to result in more sales. Lastly, equally as important is the fact that we, Rug Pad Corner, will continue to monitor the industry and to alert our readers of any false representations of products, something the readers have a right to. Our Ultra Premium and Superior rug pads are the ones we offer that contain felt and the ones that incorporate the RPC Heat Pressing® Process – Once compressed into its pile, the rug pad then undergoes an intense heat pressing to keep the fibers together for many years. Fortunately, due to the genuine nature of our process, we had the right to register it with the United States Patent and Trademark Office, a feature of which our customers should be aware and one that should bring peace-of-mind as they use our rug pads on their floors. We know that all of us here at Rug Pad Corner can sleep better knowing our customers’ floors are completely safe using any of our rug pads – We wonder what other sellers can honestly say this! Rug Pad Corner Instagram Gift Card Giveaway! At Rug Pad Corner our pets are just another member of our family. In honor of our lovable pets we are holding an Instagram photo contest. The winner of our Instagram photo contest will receive a $150 Gift Card to Rug Pad Corner! For more information on how to enter, check out our contest page or just post your photo on Instagram with the #RPCpets and tag us. If you don’t have an Instagram share this with your friends that do! Spread the puppy love! Have your pet strike a pose and post your favorite pic. Whether it is a lovable lizard or a cute kitty we can’t wait to see them! It’s their time to shine and it’s your chance to show them off! Post your favorite pet selfie using #RPCpets to enter! It’s that easy! Join us in celebrating our favorite furry friends! Our rug pads will add extra comfort to your home that you and your pets will be amazed by. At Rug Pad Corner we pride ourselves on being a green certified company. Our green certifications ensure that our rug pads will be safe for your family and your pets! Our bloggers have proven that pets love our pads. Worried about your pets scratching up your beautiful hardwood floors? We have the solution for you! Whether it is our non-slip Ultra-Premium for your rambunctious puppy or something that will just add comfort like Superior all natural felt rug pad, you will be amazed by our rug pads. Your pets can feel the difference our rug pads make and you will too! Enter your photo by 6/30/15 for your chance to win! The winner will be announced 7/7/15 and will receive a $150 gift card to Rug Pad Corner and the winning photo will be featured on our website and social media accounts. Our rug pads are desired by various consumers, to include interior designers, architects, builders and rug dealers and we are always happy to accommodate all types of customers. We can now include Movie Celebrities to our list of those customers requesting our rug pads, as can be seen by Ashton Kutcher’s recent basement makeover for his mother. 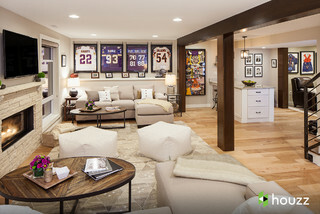 In conjunction with the popular online home furnishings resource, Houzz, Ashton Kutcher surprises his mother with the makeover of the basement of her Homestead, Iowa home, the same home in which Ashton was raised and the one in which his mother and step-father still live. The makeover involved a complete gutting of what was once a gloomy and outdated basement, only to to transformed into a modern and fresher looking living space. As can be seen by the picture to the right, the previous basement was home to darker surroundings of carpeting, dark colored walls and older, outdated fixtures and furniture – Perhaps something that Ashton’s mother became accustomed to as “Home”. According to interior designer Catherine, the space “wasn’t organized or well-displayed. It was just overbearing. A close look will show more “old-fashioned” furniture, which was something that was probably practical as Ashton grew up. As part of the transformation, Ashton and his interior designer replaced the carpeted floor with beautiful lighter colored wood flooring, just another way to lighten the space to give it a “fresh and airy” look. And, on top of every great wood floor lies some beautiful and functional area rugs, as they chose some to add a perfect compliment to the “new” look of the basement. With the area rugs come quality rug pads and so enters Rug Pad Corner – Our Super Hold all natural rubber rug pad was chosen to secure and protect the area rugs and floors. While each of the rug pads we offer reflect the most natural of their type, Super Hold was chosen as a very effective compliment to the type of rugs chosen for this project – You may see the product in the Houzz article here. As a natural low profile rug pad, Super Hold works perfectly with flatter rugs, hence the reason it was chosen for use under the rugs in this basement. For the main living space, a flat-weave rug in neutral tones was chosen as a wonderful compliment to the rest of the decor. Super Hold is a 1/8″ thick non slip rug pad that works great with flat-weave rugs because of the nature of the rugs – They are meant to be close to the floor, almost like a painting, and a thicker rug pad does not do justice to the look achieved by this type of rug. Since like with most consumers, Houzz, Ashton and the interior designer wanted to maintain a natural quality to this renovation, Super Hold was simply the right choice – Unlike other “mesh looking” rug pads, Super Hold is all natural rubber, not plastic, and is made in the USA, not China. The rug pad is rated as a “Green” product, does not off-gas and does not smell. Lastly, since flat-weave rugs tend to slip, Super Hold naturally holds to the floor with the rubber material, keeping the floor safe for use in a low-profile manner, never obstructing the rug or floor. Rug Pad Corner is proud to have been chosen by Houzz and Ashton Kutcher as the rug pad supplier of choice for the surprise Mother’s Day Makeover of his mother’s basement – While we are already used to being in most consumer and interior designer homes, we will admit that it’s an added benefit to be among the “Rich and Famous” – Thank you, Ashton, and we hope our rug pads serve their purpose for many years under your mother’s area rugs! We have always offered our rug pad orders with free shipping within the contiguous United States and 30 day returns, with return shipping the responsibility of the customer. We are happy to announce today that we have revised our Return Policy to state that returns are accepted within 30 days and return shipping is now free. There is always an incentive to buy your rug pads from Rug Pad Corner and the first one is the fact that our rug pads are like no other – The finest materials and construction safe for all floors and homes. Today, we are happy to offer another incentive and that is the fact that any return is now free shipping – Rug Pad Corner will pay for the return shipping charges. This very welcomed part of our Return Policy comes after much demand from some customers and we listened – Effective April 15, 2015, there are no return charges if you need to return your order to us, for any reason at all. “I think one of the biggest surprises to our customers when they place their first rug pad order is that fact that shipping is free”, states Sam, managing member of Rug Pad Corner. “I am sure that the same customers will now be equally surprised and pleased to know that returns won’t cost them anything either!” Sam explains that there are customers who ask how much shipping will be if they need to return their item – the answer now with the new Return Policy is that shipping is no charge and the staff at Rug Pad Corner is looking forward to saying this to more and more customers. Customers normally pay astronomical fees for return shipping and this has always bothered us at Rug Pad Corner – So bothersome, that we often offer customers our return shipping rates that are simply deducted from their final refund. This fact alone makes it that much more satisfying to now offer Free return shipping – Customers will no longer need to struggle with high UPS, FedEx or USPS shipping rates. “It may sound ironic, yet based on the fact that we will be making the ordering process even more comfortable for customers, we’re actually happy to pay for any return shipping that needs to be paid for”, says Sam. Returns at Rug Pad Corner comprise less than 1 percent of sales, considerably lower than the e-commerce standard of 10%. This means that for every 1000 rug pads shipped and delivered, only about 10 may be returned, whereas the e-commerce norm states more like 100 items can be returned. Considering this fact, Rug Pad Corner is pleased to pay for its customers’ return shipping. 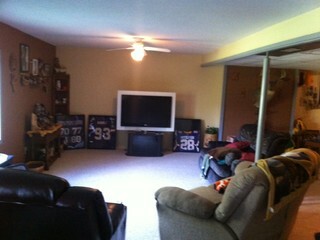 If you have shopped Rug Pad Corner already, then you know how simple and easy ordering your rug pads actually is. In the event you now need to return part or all of your order, as long as you purchased it April 15, 2015 or later, you will also see how easy and simple that is – Just send an email and we will reply with the return instructions and pre-paid return label. Shopping for your rug pads has literally never been easier. Rug Pad Retailers of America recently announced that Rug Pad Corner has been voted as Rug Pad Retailer of the Year for 2014. The results are a combination of votes from interior designers, actual customers, rug stores and architects. As if there weren’t enough reasons to trust Rug Pad Corner for your rug pad needs, we give you one more! The Rug Pad Retailer of the Year award is sponsored by Rug Pad Retailers of America and is based on several criteria – The store’s commitment to customer service, the materials within its rug pads, prompt and reliable shipping, as well as value driven prices on rug pad offerings. Based on this criteria, more than 100 interior designers, customers, rug stores and architects voted and Rug Pad Corner was voted as Retailer of the Year. Based on all above criteria, Rug Pad Corner scored perfectly on all levels – We are proud of our service, products and performance as we continue to maintain a perfect score. Since our customers include the end user, as well as the trade, we offer a very diverse range of products and services and we cater to each sector as is expected of us and more. We are proud to accept this honorable award. In an industry where products are commonly misrepresented, it is reassuring to know that our followers appreciate what we actually offer – Genuine natural American-made rug pads without any chemicals, plastics or adhesives. Far too often, inferior rug pads are offered and represented as “natural” and “made in USA” – Unfortunately, most of these representations are not accurate and are based on what customers want to hear. Rug Pad Corner and its family of members stem from all aspects of the flooring industry and we are committed to maintaining our promise of manufacturing natural rug pads made without the common additives that can harm the floor and air we breath. Rug Pad Retailers of America is the industry resource related to rug pads made in the USA – It supports the Rug Pad Industry with services throughout the United States and Canada. The organization is the dependable source for information related to rug pads certified as made in the USA, as it rates every rug pad supplier to maintain a green and American environment within the rug pad industry. Membership means that suppliers are able to prove their commitment to offering only American-Made rug pads with the most natural materials. For this reason, membership is limited and Rug Pad Corner is very proud to be a member in excellent standing. Consumers are urged to refer to the organization for all news and facts related to American-made rug pads, as well as a reference and resource guide – Those members and stores in good standing can be trusted as offering quality American-made rug pads.